"Cranberries & Holly" Crystal beads decorated with holly berries and leaves. Also transparent red spacer beads. Price: $18.00 for the set of 11 beads. "Snowbaby1" Baby snowperson decked out in a red sock hat and Christmas scarf. He measures about 22mm long by 15mm wide. Also included are 4 10mm cake beads. 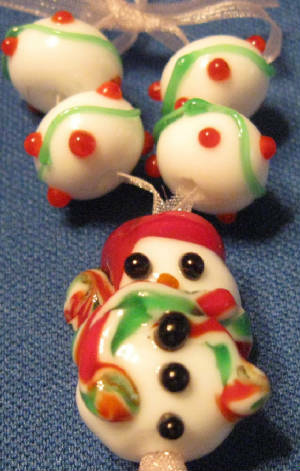 PRICE: $12.00 for the set of 5 beads. 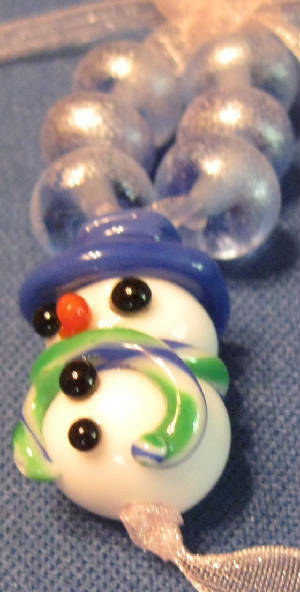 "Frosty" A tiny snobaby done with a blue hat and a white, blue and green scarf. He measures about 21mm long by 12mm wide. Also included are 6 8 mm transparent blue spacer beads with a silvery frosting. PRICE: $10.00 for the set. "Snowbaby3" Another tiny snowbaby attired in a green sock hat and Christmas scarf. He measures about 18mm high and 12mm wide. 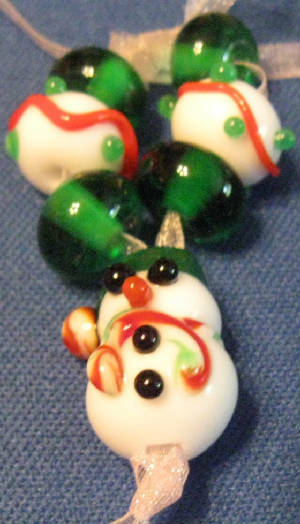 Also are included four transparent green 9mm beads and two 12mm Christmas beads. PRICE: $8.50 for the set.